Faye Earnest has been painting for over 25 years, and the earth and environment has always been her theme. With three degrees in art from the University of Alabama, University of South Alabama, and the University of Southern Mississippi, her work has evolved from romantic landscapes to the abstraction of nature. Searching deeper within our Earth, she became curious about the minerals and metals within the interior. Her works represent a geological core sample enlarged to produce a conceptual mixed media painting. 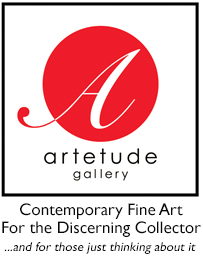 Earnest has exhibited in multiple galleries in the South in addition to New York, Germany, Greece, St. Thomas, Las Vegas, Miami, Santa Fe, Dallas, and New Orleans. With national and international collectors, she continues to strive for innovative forms to express her intrigue with the geographical and atmospheric views of our planet. Articles, reviews, and images have been in Gallery and Studio Magazine (New York) Gallery Guide (New York), Art in America (New York), Southwest Art (United States), Pasatiempo (Santa Fe) and many more.